Episode 1 available to download now. The dedication of modders never ceases to amaze me. Yesterday, a new mod for DOOM II launched its first episode after twelve years in development. I’d struggle to focus on a single project for twelve days. The mod, bearing the slightly bizarre name of Annie, was created by amateur level designer Serge Jaeken. According to Jaeken, the mod includes “many custom elements” like textures, music, monsters, weapons and more. 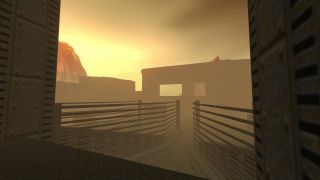 In addition, it was created using GZDoom, which means it takes advantage of several visual effects not available in vanilla doom, such as fog, 3D floors, slopes and scripts. Indeed, it looks more like a Quake mod than a DOOM II mod, as you can see from the images below. “The UAC headquarters on Earth received a distress call by the last of the remaining UAC personnel on Thanatos. The message that the headquarters received was disrupted and chaotic, so the marines sent in to deal with the situation didn't know exactly what to expect on Thanatos and were quickly overrun by the invaders. Sounds like a fine premise for some classic DOOM demon blasting. You can download episode one of Annie either from ModDB or directly from Jaeken’s website.